Protecting the Police OfficersFirst RespondersFire FightersMilitary who protect us. 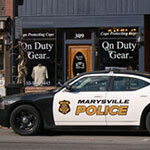 On Duty Gear sells everything the professional needs to do their job, from body armor and uniforms to badges and boots. We have an expansive offering on the showroom floor and offer all line options through our e-commerce platform. We only carry brands that we would trust our friends and family to use. All personnel have brought with them several years of experience in their respective position. For example, Paul Riddell comes from a long family line of Law Enforcement Professionals and he himself served in that same capacity for 15 years before transferring full time to his current position as our President. Paul knows the demands that are placed daily on the uniforms and equipment that are used in the line of duty and ensures that all new products are subjected to durability testing before they are approved for sale by the company. Also, because he was a Police Officer, Paul knows what to look for when scouting new product and the right questions to ask before picking up new lines. On Duty Gear does business through both "Brick and Mortar" sales as well as our e-commerce platform. Currently serving Macomb, MI and surrounding counties through the brick and mortar location and serving United States through the e-commerce platform. 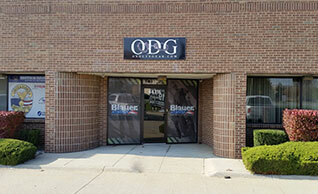 On Duty Gear's "Headquarters" is located at 44315 N. Groesbeck Hwy, Clinton Township, MI 48060. In June of 2014 we opened our second location in Clinton Township, MI. Located just off the Hall Road corridor, we are able to serve the entire Macomb County and surrounding regions. In 2007 we opened our first retail location. Located downtown in Port Huron, Michigan, we finally had a place to call home and a walk in location for our officers to shop and visit. In 1999 we started our e-commerce site to compliment our road sales. We were one of the first site serving police officers on the internet and enjoyed servicing officers across the United States.